Our Library. 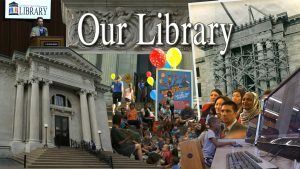 Morgan Atkinson's documentary of the Louisville Free Public Librraries. This 2018 documentary produced by Morgan Atkinson, is an examination of that most valuable community treasure — the Free Public Library. This thought-provoking video explores the value, meaning and impact of a free library. Is the community’s investment in a public library at least equal to its benefit from it? How does a library survive the spiraling momentum of digitizing text and making all ‘content’ increasingly available through computers and mobile devices. Atkinson has fun with this deep topic, taking the audience on a tour of Kentucky’s largest public library system, Louisville. Along the way, the importance of a library to a democracy unfolds. Acclaimed Louisville actor/musician, Will Oldham, is the quirky yet reliably knowledgeable tour guide, playfully exposing the challenges faced by the public library system, while pointing to intriguing details of its history at varied branch locations. Library relevance. This is the bottom-line quest and question of “Our Library”. Louisville’s library system is an ideal setting for this journey. We see closings of library branches, openings of others, and an insiders look at the library staples which keep the value of the library alive for generations to come. In other programs, Atkinson has taken viewers behind the walls of a monastery and inside the locker room of a basketball team. Now he shows why the public library is one of the most important institutions in a community. It takes many hands, minds and hearts to make a documentary. The following deserve sincere thanks as well as credit for bringing “Our Library” to the screen. The generosity of many others enabled it to progress.